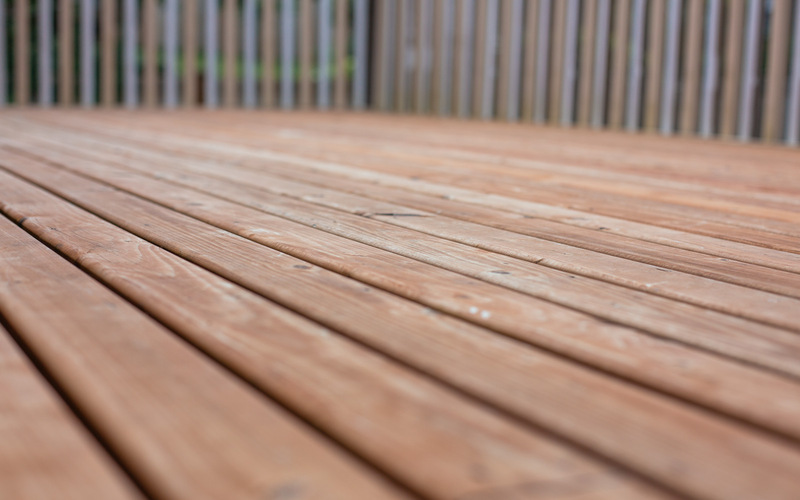 One of the most surprising things I’ve learned about decking is how often it needs care. 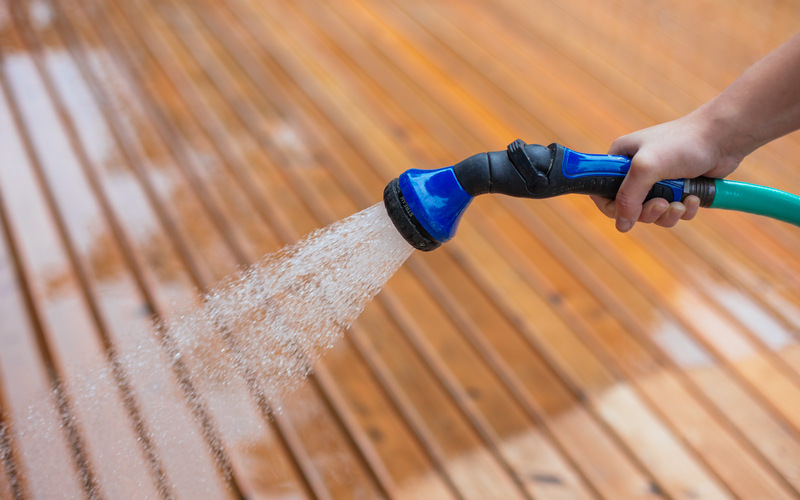 I always thought a deck needs to be cleaned and refinished when it looks old and gray—but the truth is that deck maintenance is more like sunscreen. If you wait until you see a sunburn, the sunscreen will only be able to help so much. But if you apply the sunscreen before you begin to burn, you spare yourself the discomfort. In the same way, your deck needs protection from the elements. It will last longest and look best if you reapply that coverage before it has worn away. 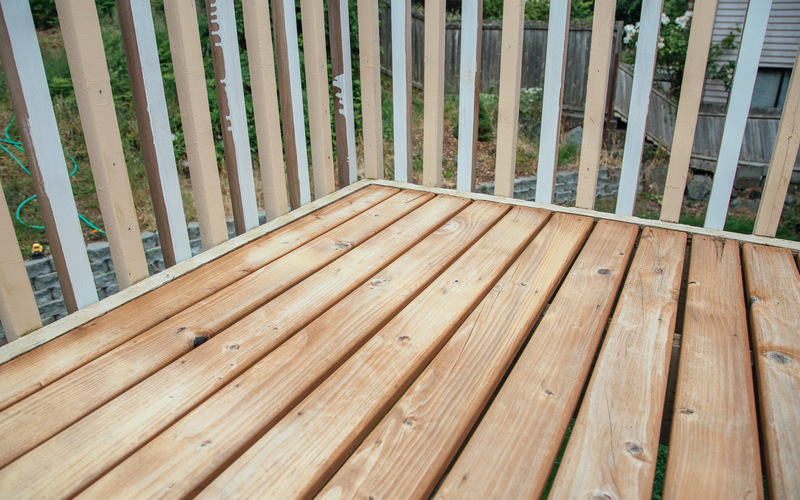 For this tutorial we refinished a deck using Penofin Verde. Penofin is a deep penetrating finish that coats and protects the fibers of the wood, not just the surface. No stripping or sanding is required, so future care of your deck looks as simple as cleaning, maybe brightening, and staining. Their Verde line is an interior/exterior petroleum-free oil finish with no heavy metal compounds, odor, or offensive fumes. 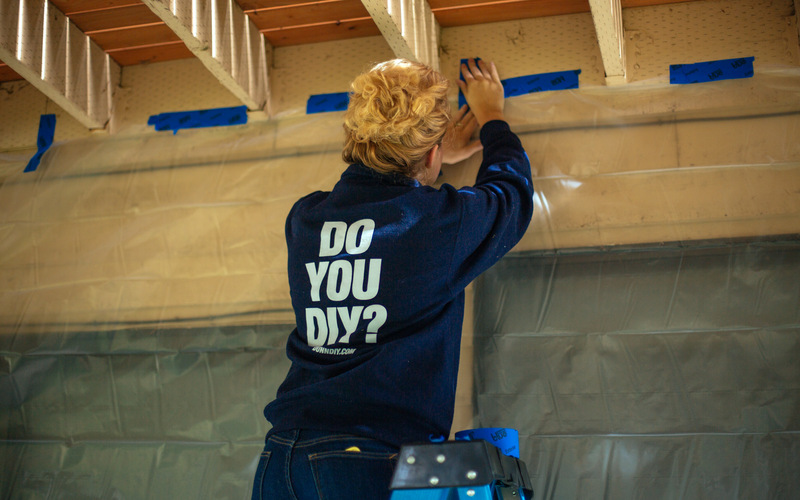 It’s important to remember that before any of these steps comes the prep work of your deck. First you will need to measure your deck and write down the square footage. This will help you calculate the amount of product you will need to purchase. One gallon of Penofin stripper covers 300 square feet. A one-gallon container of powdered cleaner or brightener covers 4800 square feet (smaller sizes are available for smaller jobs). Penofin Verde wood stain covers 250-500 square feet depending on the texture and condition of the wood. We used about half a gallon for our 231 square foot deck. Once you’ve determined how much you will need to buy, it’s time to settle on color. 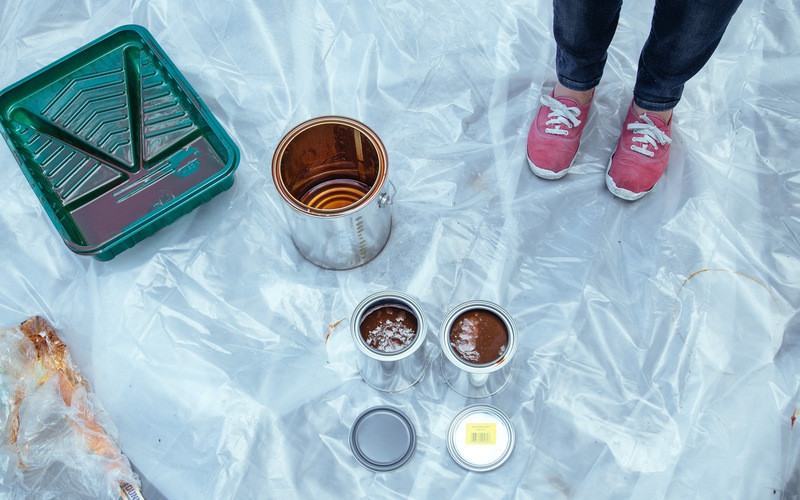 When choosing a stain take into account the color of your house and of any furniture or pots sitting on your deck. We don’t carry the whole range of Penofin stains, but don’t worry, you can special order and it'll be ready for pick up in a few days. The stain that we chose was Penofin Verde in Chestnut (this color is special order). Remove any pieces or furniture, potted plants, or barbecues. At this point you will want to examine your deck, hammer down any nails that have lifted, and replace any boards that need it. 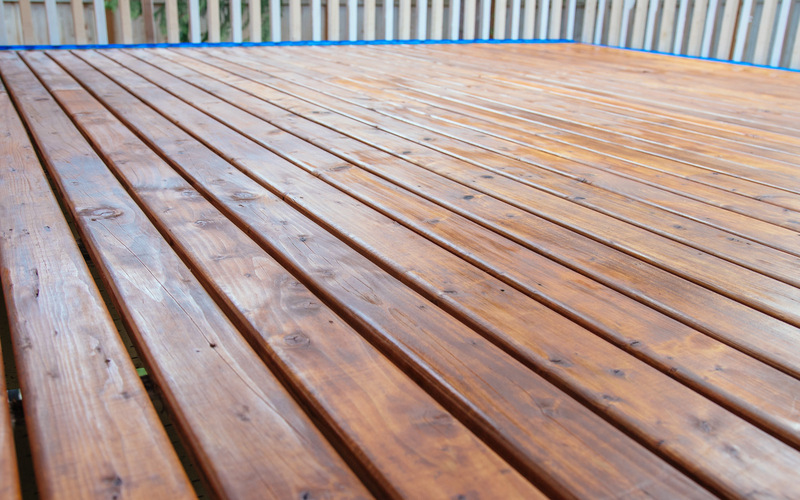 If your deck is covered in an old oil or latex stain, paint, or sealer you will need to start out by using a stripper. For our deck we were dealing with a much lighter weight stain, and so we skipped ahead to the cleaning step. Using a leaf blower (or a broom) remove any debris from the deck surface. Next you will need to protect the surfaces around the deck, and be especially careful to protect any metal that may come in contact with the Penofin cleaning products. 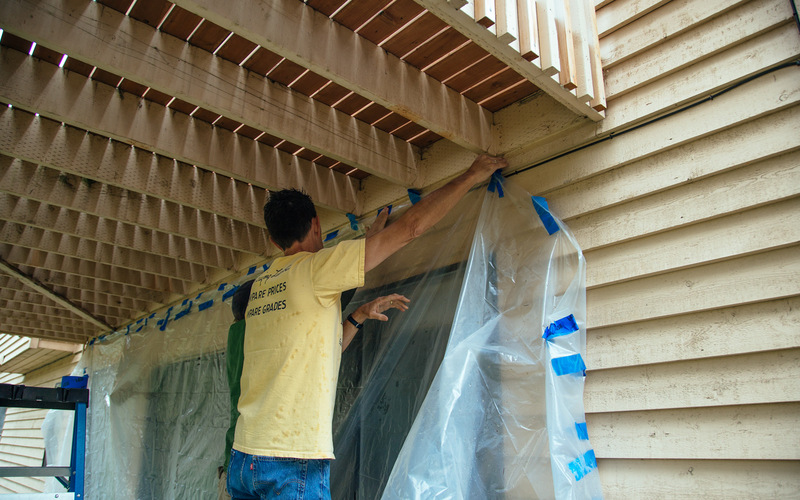 We masked off the railing, taped off the metal of the sliding door with a pre-taped masking film, and put up a sheet of polyethylene to cover the siding of the house underneath the deck. 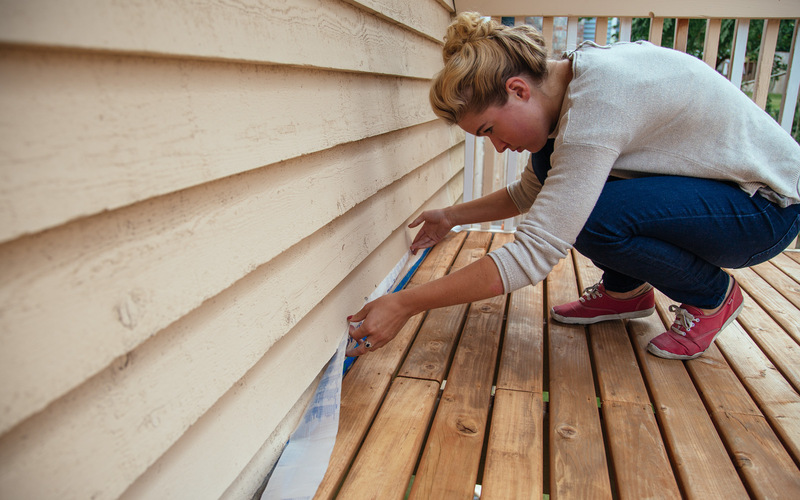 These steps aren’t all necessary, but they will help prevent inconsistency by cleaning part of your siding or railing without cleaning the rest. 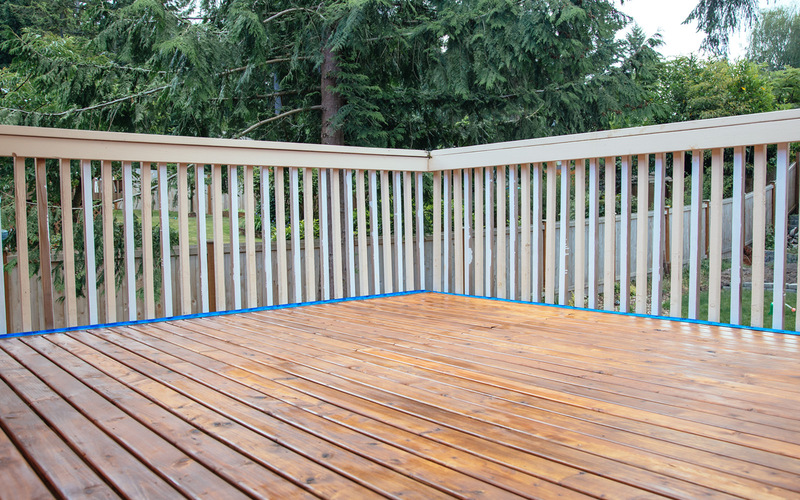 After masking, rinse off the vegetation surrounding the deck. 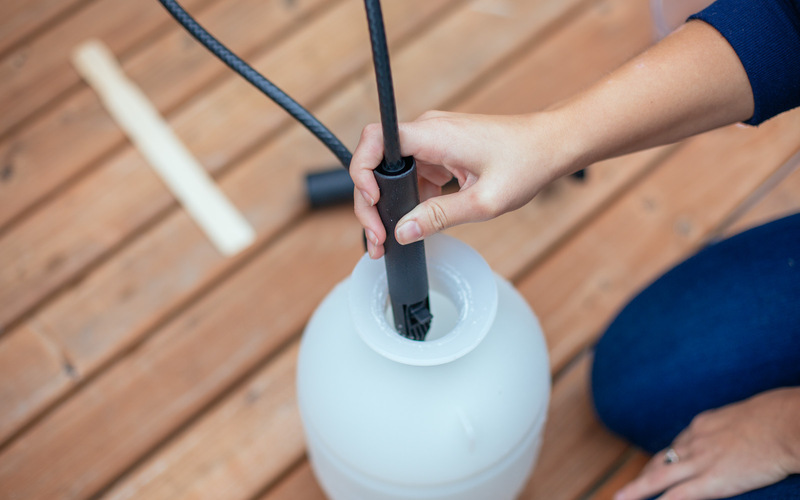 Even though the Penofin products aren’t toxic this is an added safety for protecting your plants and grass and ensuring that they are not negatively impacted by any contact. 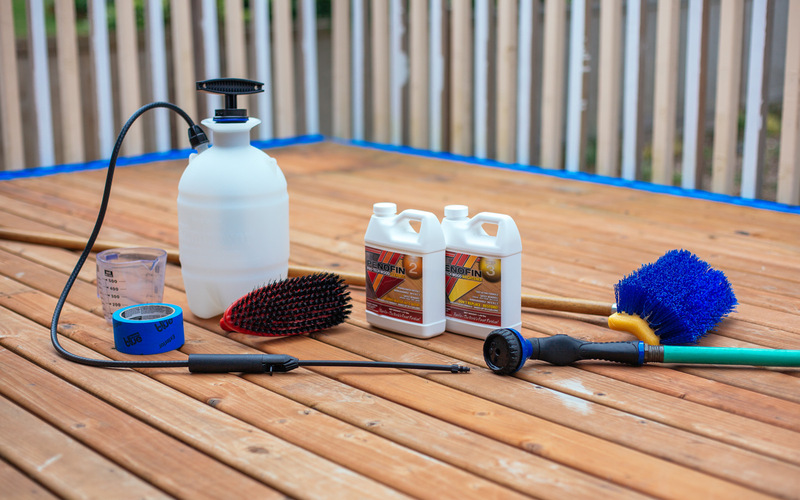 Each step in the staining process works differently, and it’s helpful to remember that the staining step is the only one that requires a dry deck. All other steps call for a wet surface and can be done back to back. 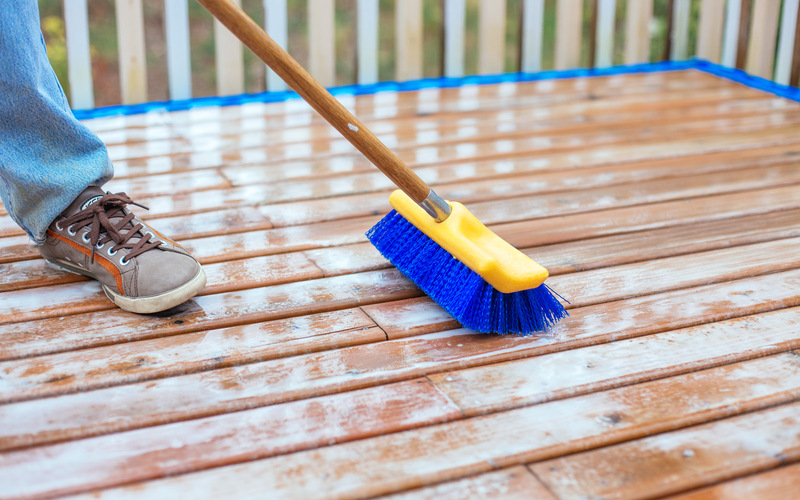 Overcast weather or a deck out of direct sunlight is really ideal for everything, and a light drizzle isn’t a problem for the stripping, cleaning, and brightening. 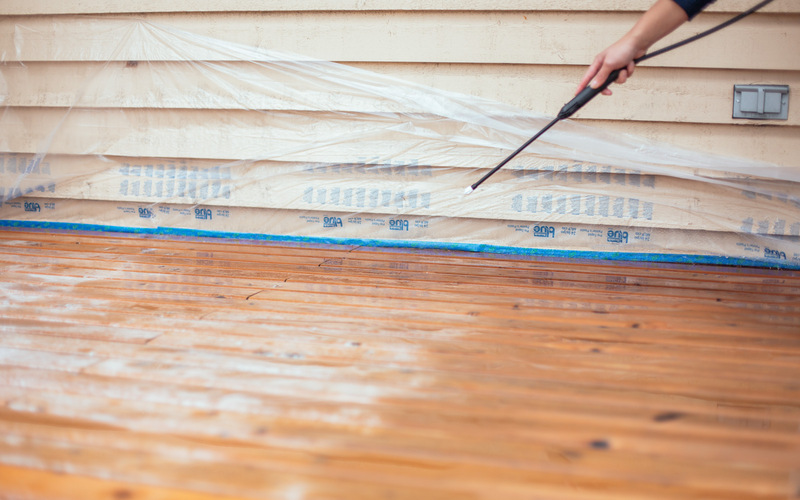 Grab your hose and lightly spray off the deck, you want to dampen the surface. 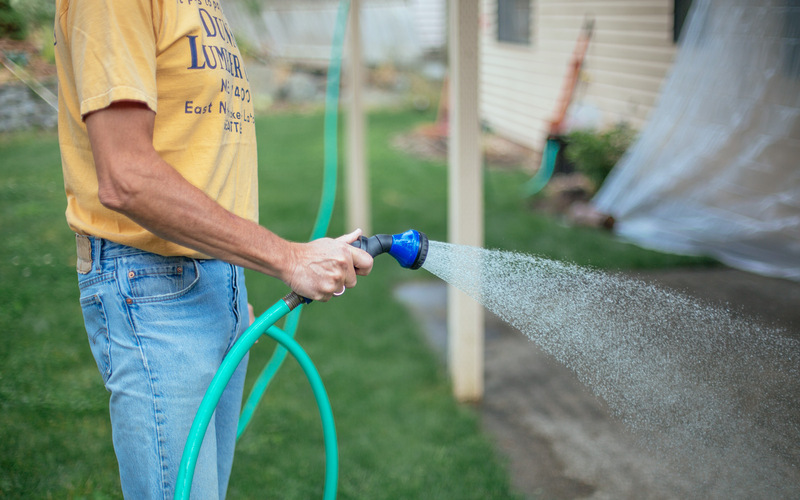 When you have hosed down your deck, mix 1-2 cups of the cleaner crystals in a pump-up garden sprayer with 1 gallon of warm (not hot) water. The amount of cleaner you put in depends on your specific deck. One cup is equivalent to a light clean, whereas two cups is more of a deep clean. You want to use enough cleaner, but not more than needed as this will just wear down the deck unnecessarily. We used a little over a cup. Be sure to dissolve thoroughly in the water to avoid clogging the sprayer. Evenly coat the deck with the product. The surface of your deck may turn white. This is a good sign. It means that the solution is at a good strength. Using a long handled scrub brush, agitate the surface of the boards. Scrub well in spots where dirt or moss is stubborn. Work in sections to make it more manageable and let the cleaner sit for 10-15 minutes before rinsing (we divided our deck into two 115 square foot sections). 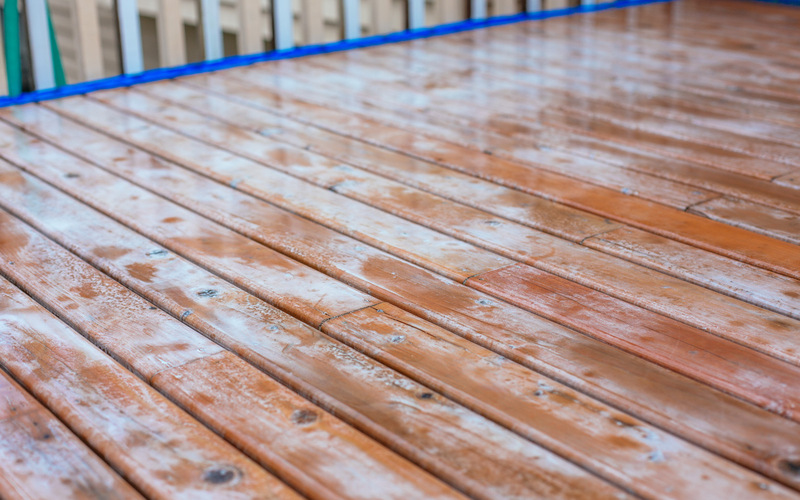 Don’t let the deck dry out while you’re waiting, so mist it with water as needed. 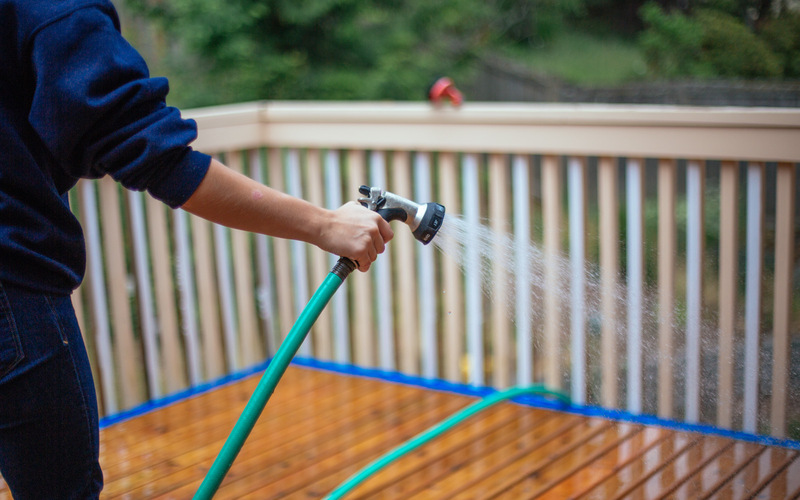 After letting the deck rest, put your hose on a setting with a fair amount of pressure and hose it down. 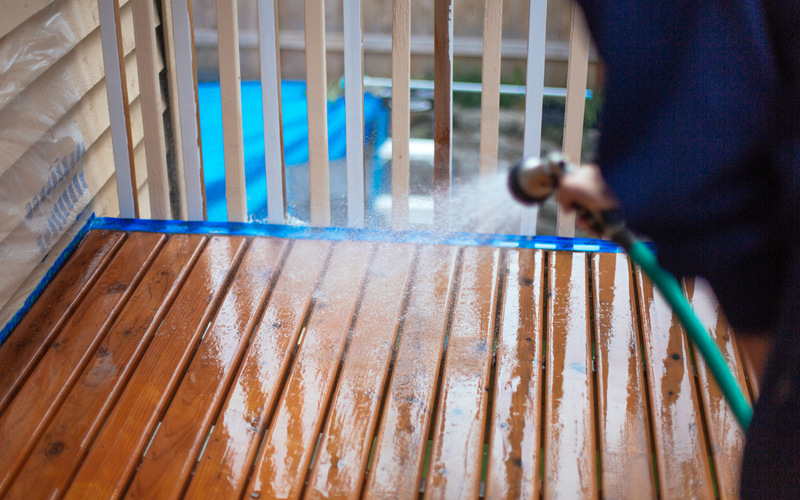 Go over the deck with the hose in the same pattern that you applied the cleaner to get the most even coverage. At this point we discovered some portions where the boards were still retaining their mossy green tone. We went over these sections with the cleaner again, and scrubbed them clean and then rinsed them off without waiting. At this point the deck already looked so much better! After cleaning comes brightening. As mentioned above you can do this step immediately after the cleaning. 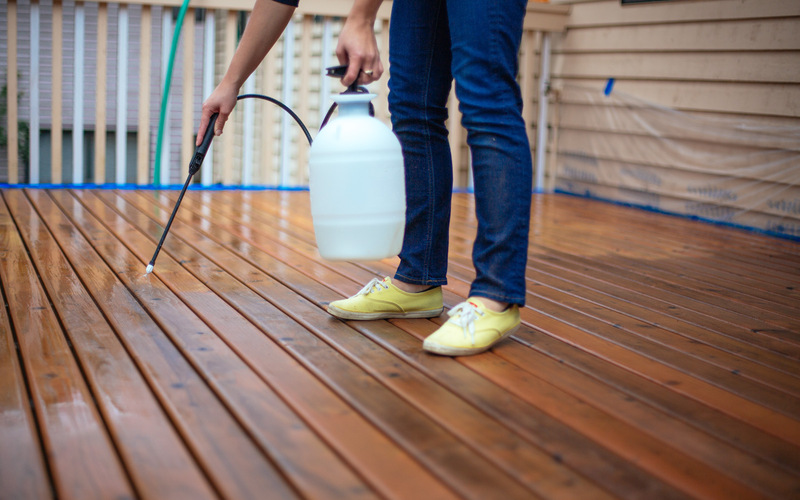 If you wait for another day, make sure that you start off by taping off and rinsing down deck and surrounding plants. Add 2 cups of brightener crystals with 1 gallon of warm water and stir until completely dissolved. We advise wearing rubber gloves and covered shoes during this process, as the oxalic acid is very hard on skin. 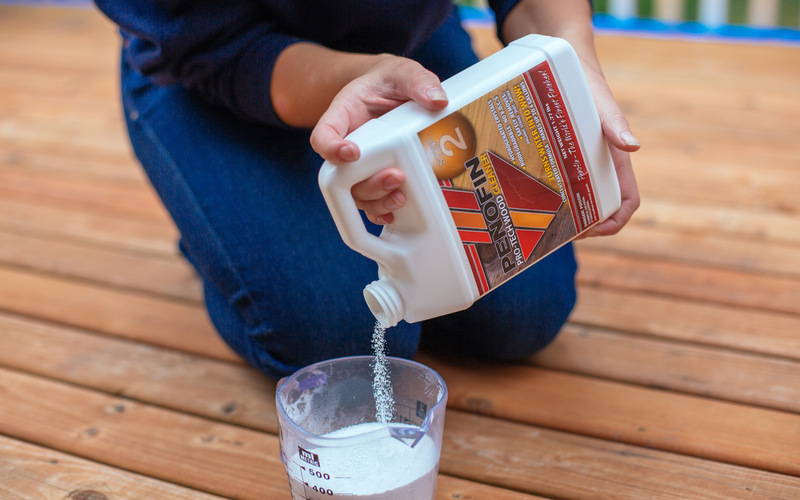 If you are mixing the brightener on the deck make sure to wash off any powder that falls on the deck because it will immediately begin to bleach the wood. Apply the brightener with the garden sprayer in the same way as you did the cleaner. This is a fun step because you can see the results immediately! For this step it’s not necessary to work in sections. Allow the brightener to sit for 10-15 minutes and then rinse off with a hose. This is the completion of day one. Before you begin staining you will need to wait 36-48 hours until the wood is completely dry. Of course, in Seattle rain is a big factor in this as well, and if the weather is cold and cloudy it will likely take longer. 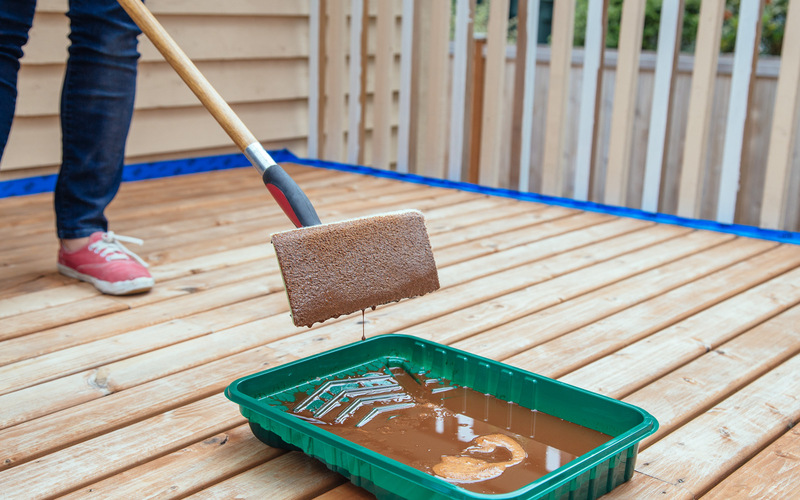 When your deck is completely dry it’s time for staining. Pick a day for this step when the weather is mild and the chance of rain minimal. Do not apply the stain if the temperature is below 45 degrees or if the surface is hot to the touch. If your deck is in direct sunlight then a slightly overcast day is ideal. 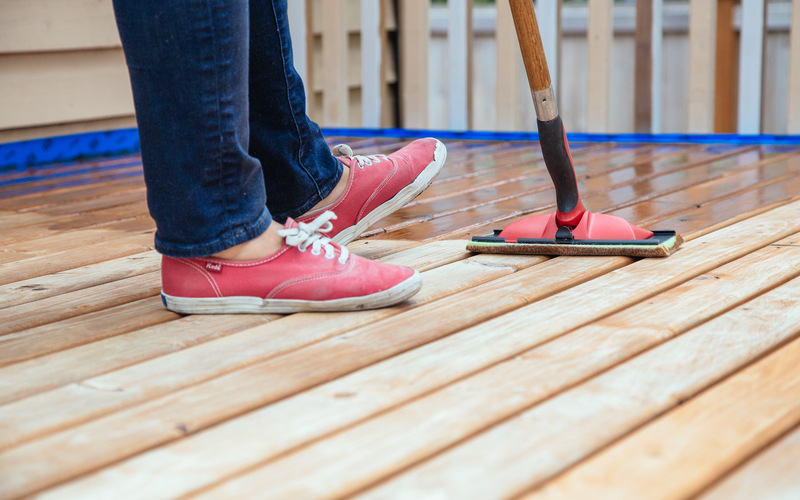 With a leaf blower or push broom remove any leaves, twigs, or other debris from the deck’s surface. If you have removed the masking and tape you will need to reinstate them. As with the previous steps, rinse off the nearby plants to help protect them. Our deck was a second story deck with a cement patio underneath. Rather than covering this with a tarp we just rinsed it off so that any stain that fell on it would run off instead of sinking in. With a stir stick mix the stain before beginning. Penofin stain contains trans-oxide pigments that protect the surface of the wood from UV rays, but they naturally sink to the bottom of the stain so it’s important to continue stirring throughout the staining process. For an easier application you can pour some of the stain into a painting tray. You can apply the stain with a painting pad, rag, or paintbrush. We used a pad on a long handle for most of the deck and a brush for some of the difficult to reach spots. Be careful not to over apply! This is the single most common mistake that people make. Penofin is a penetrating finish and there’s only so much the wood can soak up. 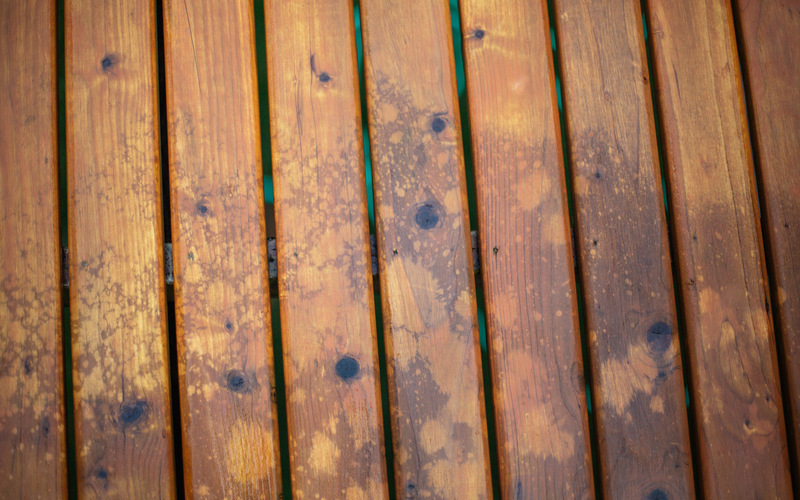 Excess stain on the surface of the wood will not dry correctly and will leave you with a sticky deck that will attract pollen and dust. Considering the coverage of the product versus the size of your deck may help you assess the amount you need to use. If you experience problems with over application, or really anything, you can call 1-800-PENOFIN. While applying the stain, work in small manageable sections. Wait 10-20 minutes to allow stain to penetrate and wipe off excess with rags. 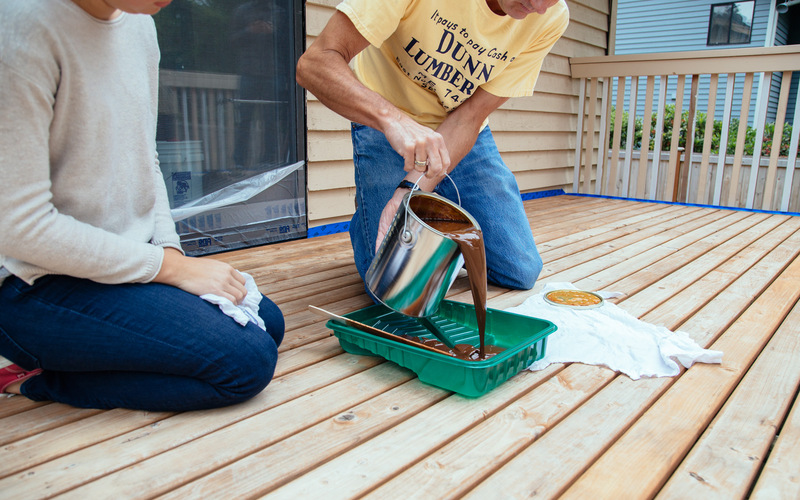 We used up almost a whole bag of rags for ½ a gallon of stain, so make sure you buy enough to cover the surface of your deck! Think about the pattern that you’ll need to stain in. If your deck is second story or surrounded by a railing make sure that you work towards the exit. With a sliding door in the middle of the deck we stained from both ends of the deck, leaving the middle section, and then worked backwards toward the door. 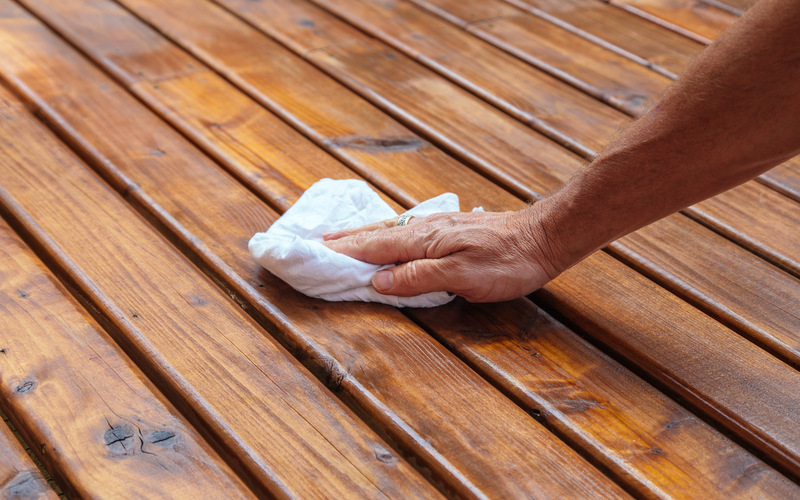 It doesn’t seem to be a problem to walk on the stain before wiping it down, but don’t walk on afterwards, and make sure to wipe off the bottom of your shoes before leaving the deck. 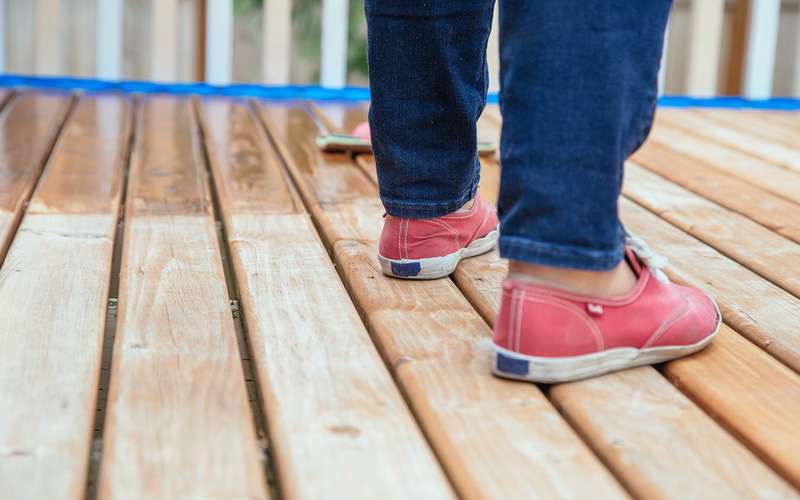 Now that your deck is finished follow the recommended amount of time before walking on it or replacing your furniture. For the Verde stain you can begin walking on it after four hours and move furniture back after twelve. There are a couple parts of the clean up process that are very important. First, if you have left over stain it will keep best if it’s in a container with the least amount of air. We recommend transferring the Penofin into quart size cans to help it last longer. Secondly, disposal of the rags is very important. If you leave the rags by themselves you risk the chance of spontaneous combustion. Penofin recommends leaving them submerged in a bucket of water for at least 24 hours before disposing. We’re excited to introduce you to Tracey Grant. In her own words, “I geek out over all things food and health related!” Tracey currently works as a registered dietitian and essential oil consultant. She takes a holistic approach to wellness. She knows that making small day-to-day choices for healthy living has a huge impact on one's ability to thrive. She regularly seeks out opportunities to enjoy and share what she learns; you can follow her on instagram to get daily tips on healthy joyful living! Today she's going to share some of her essential oil expertise and explain how to incorporate essential oils into Green Cleaning products.